Lisa Fry loves preaching, teaching, pastoral care, and congregational development. A native Mainer (Topsham), she came to St. Thomas’, after working in the church in Sarasota FL, Phoenix, AZ and Little Rock, AR. She is glad to finally be home. 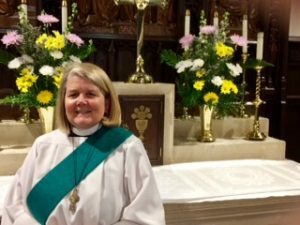 After reveling in her work with youth in various diocese across the country, Lisa answered a call to holy orders and was ordained an Episcopal priest in 2011. 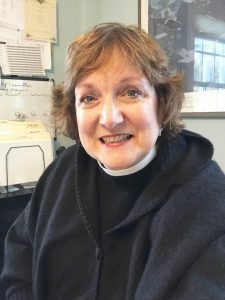 She currently serves on the Commission on Ministry for the Diocese of Maine, and is an advocate for the poor and marginalized both within Maine and nationally. She loves teaching and has taught everything from a course on Celtic Spirituality to The Lord’s Prayer in Aramaic, to the Enneagram. She loves nothing better than a rousing discussion with lots of opinions. Lisa earned her BA from Colby College and her masters at Virginia Theological Seminary. In her ‘salad days’, Lisa worked as an actor on stage, in film, and doing voiceover work. She has a married daughter, Zoe, who is working on her Ph.D. at Arizona State. Lisa enjoys antiquing, hiking and is a card-carrying Trekker and Whovian. Abby discovered the Episcopal Church in 1986, through the ministry of Common Cathedral on the Boston Common. An outdoor, liturgical worship offering that welcomes the housed and unhoused, this inclusive, genuine circle of seekers became her faith home. Abby received the Sacrament of Confirmation after being part of classes that were led by Bishop Barbara Harris. This was a deep privilege and joy for her, being confirmed by the first female bishop in the Anglican Communion. Abby’s vocational path over the years has emphasized mental health care delivery and advocacy, with a particular focus on the marginalized in our midst. Over the past ten years, she has pursued chaplaincy, first at an independent school, and then more recently in a healthcare setting, Pen Bay Medical Center. Abby moved to Camden from the Boston area with her family in 2011. Ordained to the diaconate in 2015 at the Cathedral of St. Luke in Portland, Abby has a passion for helping people discover their gifts and to embrace those on behalf of God’s kingdom of love, justice, and mercy. 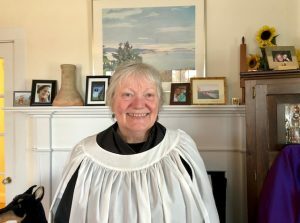 She provides training and support for the ministry of lay Eucharistic Visiting and has a deep heart for pastoral care. Abby is active in the Mid Coast Interfaith Alliance on behalf of collaborating and partnering with other local congregations. Through shared worship services and social justice initiatives the fruits of ecumenism are made visible. Abby enjoys contemplative prayer, time with friends, swimming, and exploring the islands of Penobscot Bay. When I was growing up I wanted to be an elementary school music teacher. I taught myself piano, then my mother bartered lessons for me (babysitting the piano teacher’s children). I studied and loved many instruments: violin, oboe, French horn, drums. My freshman year in college my organ professor took a few of us to an organ recital at Church of the Ascension in lower Manhattan. I was blown away by the pipe organ, played by Simon Preston. I was smitten! (and still am) My junior year I was very fortunate to be chosen to represent my college in a brand-new program as an exchange student in Frankfurt, Germany. I was allowed to study nothing but music! Organ, harpsichord, Orff Schulwerk, violin, voice, choral. My organ professor arranged for me to attend the International Organ Symposium in Haarlem, The Netherlands the summer before I returned home. Coming back to finish my final year of college, and to fulfill my commitment of passing along what my exchange year had taught me, I realized that my burning desire now was to become a church musician. Union Theological Seminary in New York City became my home for two years as I worked toward my Master’s in Sacred Music. It was a seminal experience: living and working in upper Manhattan in the shadow of Riverside Church, Columbia Teacher’s College, The Cathedral of St. John the Divine, Jewish Theological Seminary. I was fortunate to study with Vernon de Tar, Chair of the Organ Department at Juilliard, and church musician at Church of the Ascension (full circle). He was a true church musician, with worship and glorifying God always, always, coming first; and with a healthy sense of humor about the human condition (and churches). Since then I have been church musician in Charlottesville, VA, Queens, NY, The Bronx, NY, Westchester County, NY, Carlisle, PA, Harrisburg, PA and Camden, ME. Though I have had to do many supplementary jobs to support my children and me while they were growing up, I have not looked back, nor regretted it. I am having a blast!